Start by slicing bell peppers, tossing in extra virgin olive oil and pink salt and baking them on 350F for about 15-20 minutes. Prepare carrots with a vegetable peeler, making thin slices. Cut open avocado, remove pit and slice long and thin. Use a spoon to scoop out the slices. Right before your bell peppers are finished, put your tortillas in the oven for just a minute or two until easily malleable. Pull them out and immediately top with hummus, a sprinkle of pink salt & black pepper. Add the spinach, carrot ribbons, bell peppers, and avocado on top. Another quick pink salt sprinkle and generous topping of nutritional yeast. 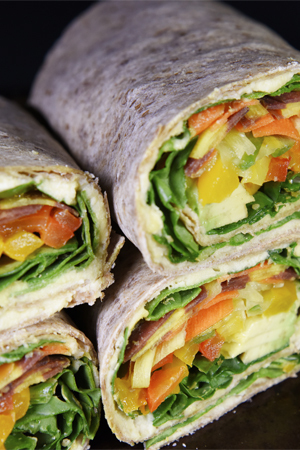 Roll it up and you’re ready for a filling, colorful meal!